My friend, Nik, decided to purchase an interesting looking used Japanese Ibanez RG the other day at Guitar Center for only $99. At that price it would be easy to part this thing out on eBay and make a small profit. Since this is a Japanese model, the neck and body are of excellent quality and the action and feel of the neck are superb. The previous owner had an insane string gauge on this guitar (the G string was wound!). After a good cleaning, I popped on some .009 gauge strings and now the guitar feels much more like a shredder. Opening up the guitar to peak at the electronics I can't tell what the pickups are. They're apparently some generic cheapos and the potentiometers are of the tiny variety typically used on guitars and basses with electronic cavities that have limited space. This is real beater due to the strange pattern painted on the body and the lack of locking nut for the Floyd. The pickups and electronic components will need replacing, for sure. However, if the were guitar fitted with a self-lubricating nut, locking Gotoh tuners and new pickups it could possibly be a keeper. We'll see what Nik decides to do. After much testing and tweaking I have decided to remove and return the Seymour Duncan P-Rail pickups and Triple Shot pickup rings. I just could not get used to the dark humbucker tones they produce in series (normal humbucking mode). The P-90 mode sounded fantastic (mainly because they are real P-90s!)... but the dark humbucking tone was the deal breaker. 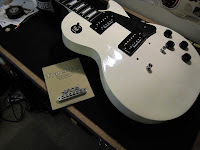 Since I used the Seymour Duncan JB and Jazz pickups that were previously in this guitar on my new Alpine White Gibson Les Paul Studio, I decided to throw in a couple of WCR handmade boutique pickups I had lying around. The neck is a chrome covered "mystery" pickup because I do not know what model it is. :) Jim of WCR has a bad practice of not labeling his stuff, so I have no idea what it is (though, I suspect it is a Crossroads). The bridge, though, is definitely a Crossroads model with double black bobbins and no cover. After popping these in and doing some basic height adjustment to fine tune the sound I am very pleased with the result! These things sound phenomenal with the RS GuitarWorks vintage complete kit and my favorite treble-bleed mod. I didn't think this Les Paul could sound better than it did with the Duncan JB and Jazz pickups, but I can really hear the wood now. The tone I get with this guitar plugged into my Kingsley D32 plus Kingsley Jester pedal is truly unreal! I found a great website recently called Free Jazz Guitar Lessons and noticed they referred to this software called "Band-in-a-Box" quite often. They even had some clips generated by the application, and it sounded pretty good! Naturally, I was intrigued since I do play a lot at home with backing tracks and loops. I am always on the lookout for backing tracks, loops or anything that can help me create them. I decided to order the "Band-in-a-Box" 2010 MegaPak edition for Windows, which runs about $200. I opted for the discs and manual to be sent to me, but I was also able to instantly download everything if I wanted to, which I thought was really cool. So I went ahead and downloaded many gigabytes of audio and .exe files, which took a while. :) Only a few days later the package with all the discs and the manual arrived in the mail... nice, prompt shipping. I still have much to learn about the software. One thing that is really impressive is the fact that instead of relying solely on MIDI sounds Band-in-a-Box is now using real sound sample triggering of actual musician performances for a super realistic and quality sound. It truly is amazing to hear random, computer generated compositions played on the fly with real instrument timbres and tones! Once I learn more about the application I will post a more in-depth review. One thing I've noticed is that since this is an old application (dating back into the 1980's, I believe) there are some challenging interface issues that is so often the case with older applications like this one. There are tons of buttons and menus all over the place, making the whole UI fairly unintuitive and cumbersome to use. However, the power of this thing is well worth the learning curve and I plan to dig into it more when time permits. It took me a few days and some patience to get all the modifications done to my (new to me) 2003 Alpine White Gibson Les Paul Studio. The guitar itself is in excellent condition considering it is used and about 6 years old. There are a few dings here and there, as one would expect, but overall the finish is in remarkably good condition. I get the impression that this particular guitar was not gigged at all and was probably kept in its case most of the time. First thing I check on a used guitar is how much neck warp there is and if the truss rod adjusts properly. This particular guitar's neck has a very slight tongue warp, but well within a reasonable amount; the truss rod nut moved very easily and does its job with little movement. So, all good on the neck. The only thing this guitar needed to be playable was a new nut. 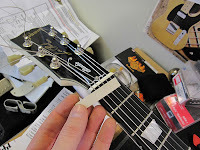 The factory installed nut had a low high E slot that caused buzzing at the first fret when playing the string open. I use the best nut material on earth (Slipstone) which is normally sold by Stewart MacDonald... but at the moment they have none in stock due to the old manufacturer discontinuing the formula that Slipstone nuts are made from. Slipstone is really a plastic called "delrin" that is used for a variety of industrial applications (some guitar picks are also made from it). The particular formula that Stew Mac uses is impregnated with teflon and has a custom, bone-like creme color. It is actually slipperier than Graph Tech and, due to its off-white color, looks OEM on most guitars. Stew Mac assures me that they will be stocking Slipstone nuts in the future as they are currently in the process of lab testing a new delrin manufacturer's product. I chose micarta (also a type of plastic) for this particular nut. I'll likely replace it sometime in the future when Slipstone becomes available again. The first thing I did was cut off the old strings and began de-soldering the old electronics. 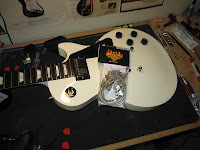 The OEM pickups were the ceramic magnet Gibson 490s. Super high gain pickups, but just a bit too harsh for my taste. 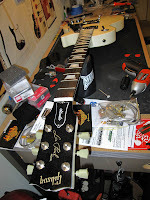 After rewiring the whole guitar with an RS GuitarWorks complete Modern Kit (switch, jack, potentiometers and caps) I popped in my favorite Les Paul pickup config: Duncan JB in the bridge and a Duncan Jazz in the neck. The electronics process went very smoothly with no major hiccups. I will say t hat I finally got myself a good soldering iron and I highly recommend buying a good one if you decide to try your hand at soldering. I bought a 40 watt Weller wand-style soldering iron for $17 on Amazon because my previous iron never got hot enough to melt the solder completely, which can lead to cold solder joints and messy wiring jobs. Do yourself a favor and get a 40 watt Weller wand! 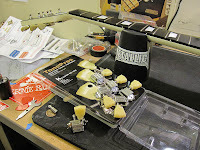 With the electronics marked off the list it was time to install the new TonePros bridge. I bought this bridge thinking it would be a substantial upgrade from the existing bridge, but I was suprised to find out that they seemed to be about the same in both wei ght and quality. The main difference being the TonePros having the locking mechanism for better coupling and bridge stability when changing strings. Since the old bridge seemed to have pretty good string spacing I decided to use it as a template for marking the TonePros' saddles for slotting. Worked out great and I was able to knock out the whole operation quickly. The hardest thing was getting the press-fit bridge post slugs out of the guitar. With extra care and patience I was able to coax them out without any major catastrophe. With the electronics now installed and the new bridge firmly in place it was time to string up to test everything out before moving on to creating the new nut. I must say I am impressed with how great these pickups and the RS wiring kit make this guitar sound! It has huge tone. Huge! 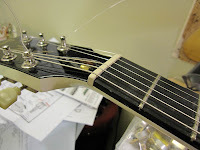 After testing I loosened the strings enough to allow the stopbar tail piece to slide out, with strings still attached to both the tail piece and the tuners. 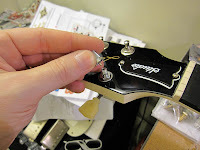 This is a clever way to remove all the strings from a Les Paul at once (and pop them back on) easily... a very useful trick when making a nut. 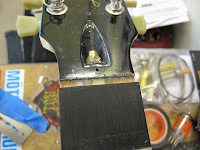 With the strings and stopbar placed to one side and the headstock and fretboard protected, I then scored the old nut to detach it from the finish. O nce scoring was complete I began to attempt the removal of the old nut. This proved to be quite a challenge! Not sure what the factory used to glue this nut in place, but it simply would not budge. I tapped and tapped and tapped, applied heat with a hair dryer and tapped some more... nothing. I had no option but to destroy the old nut. Even this proved to be extremely difficult! I used a very sharp blade from a Leatherman tool and the handle of a screwdriver to carefully chip away at the old nut until it finally started coming out in chunks. I am happy to report I was able to get it all out with no damage to the guitar's finish or nut slot! 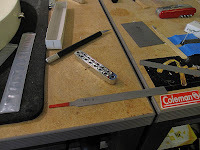 With the old nut out and the slot cleaned up I began to fashion the new nut from a micarta blank. 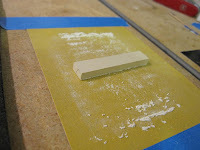 I basically just tape down a piece of 800 grit sandpaper to my workbench and grind the nut down by hand. This ensures nice, level sanding but it can be pretty laborious. I also use a Dremel for certain procedures to speed things up. 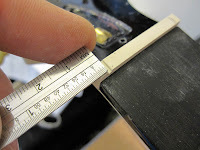 Once I got the shape and fit I wanted I measured off the two outer E strings at about 1/8 inch from the edge, then used my awesome Stew Mac nut slot ruler to figure out the placement of the inner slots. After popping the nut on and off the guitar for minor adjustments, slotting was all that was left to do before gluing it in permanently. I used my slotting files I bought a while back from Warmoth (part #NFS8 for only $64.00) which is a great deal for nut files! They are excellent quality and work very well, and I paid a fraction of what a similar set of files would cost anywhere else. With the slots properly radiused to the neck (12 deg) the nut was complete! I beaded the nut slot with some water diluted wood glue and carefully set the new nut, placed the strings in the slots and tightened them down for the nut to dry overnight. 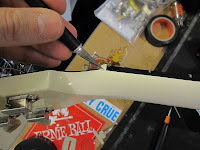 The final step was to install the locking Kulson tuners, clean the fretboard, polish the frets with 000 steel wool, restring and make final action and truss rod adjustments before intonating the guitar. The Kulsons matched up with all the existing headstock holes perfectly, no need to drill or modify the guitar in anyway. I think all Les Pauls can benefit greatly from having locking tuners, and all of mine have them. 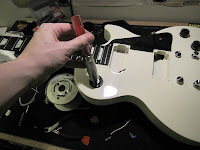 The cool thing is that these days one can obtain retro-fit tuners for just about any guitar, which prevents unnecessary headstock drilling and reaming that typically devalues the instrument. 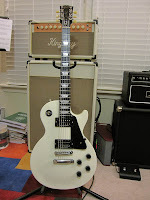 This is one of my best sounding Les Pauls, despite being a cheaper, regular production model. Acoustically the guitar is quite loud and crisp and that certainly translates to the plugged-in tone which is huge and articulate with plenty of sustain and output to drive the amp in both positions. The neck position tone might just be the sweetest of all of my Les Pauls! The Duncan Jazz is simply stunning in this guitar. After several years of the same look it just felt right to change things up a little bit. 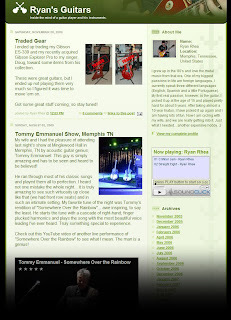 The old blog design was getting stale and loaded down with junk... so here is the new and improved "Ryan's Guitars"! 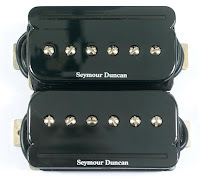 I decided to try these new Seymour Duncan P-Rail pickups I've been hearing so much about lately. 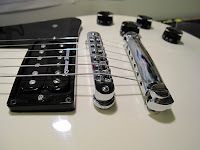 I bought a bridge and neck pair in black, and I also bought a creme set of Seymour Duncan Triple Shot rings in order to take full advantage of all that these pickups offer. The P-Rails claim to be three pickups in one with a total of four possible modes. It's a P-90, a single coil and humbucker all in one... and also capable of out-of-phase humbucker tones. 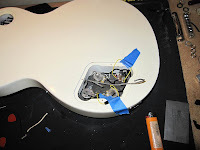 I figured that while I was in there I might as well replace the cheap stock wiring, too. I ordered an RS GuitarWorks vintage wiring kit with Jenson oil-in-paper capacitors, replacement jack, replacement switch and potentiometers. I am really looking forward to installing all this stuff once it comes in. Full report and review once everything is installed and working properly. I couldn't help myself today. :) I went to pick up an Ernie Ball Music Man Axis from my band mate, Doug, as a trade for my Gibson Explorer Pro and I ended up falling in love with this Gibson Les Paul Studio. Go figure! I have definitely been on a Les Paul kick lately. As you can see from the photo here I already have mods in progress. I plan to replace the tuners with retro-fit locking Klusons, cut a new nut for it, replace the bridge with a TonePros locking Nashville Tune-O-Matic, stick the Duncan JB and Jazz pickups from my Goldtop in it and, finally, replace all the electronics with a complete RS GuitarWorks Modern kit. Should be awesome when I am done! I'll post all the details soon.